Crwe World | MEDIA ADVISORY - The 19th Annual Scotiabank Hockey Day in Canada® is coming to Swift Current. Join us! MEDIA ADVISORY - The 19th Annual Scotiabank Hockey Day in Canada® is coming to Swift Current. Join us! SWIFT CURRENT, SK, Feb. 5, 2019 /CNW/ - Canada's biggest celebration of hockey – Scotiabank Hockey Day in Canada® (SHDiC) – arrives this week in Swift Current beginning February 6, with a series of community hockey events, culminating in a 12.5-hour broadcast featuring all seven Canadian NHL® teams taking the ice, on February 9. The broadcast starts at 12 p.m. CST/1 p.m. EST on Sportsnet, Sportsnet ONE, CBC, Rogers NHL LIVE and Sportsnet NOW. Scotiabank is proud to continue the tradition of bringing Scotiabank Hockey Day in Canada® to communities across Canada for the 19th year. Hockey matters to Scotiabank as it matters to Canadians. We are committed to helping young people reach their infinite potential both off and on the ice and have proudly helped to support one million kids, and counting, through our commitment to community hockey across Canada. Scotiabank Hockey Day in Canada® is about much more than just the game of hockey – it's about coming together as a community. We are proud to support this celebration of hockey, which brings kids' hockey clinics, games, the Stanley Cup® and NHL Alumni™ to communities across Canada. This Scotiabank Hockey Day in Canada® we are celebrating hockey memories and creating new ones and we want you to be part of it! When you share your favourite memory with #HockeyDay on social media, we'll donate $1 to the NHL® Foundation in support of kids' community hockey initiatives*. Your memories will help inspire our Scotiabank Hockey Day in Canada® mural, being created live in Swift Current. Kids get up close with the Stanley Cup® and NHL Alumni™. 5 p.m. – 6:45 p.m.
7: 30 p.m.– 9:30 p.m.
-Note: Times subject to change. Scotiabank Hockey Day in Canada® will be broadcast live, from Riverdene Park with host Ron MacLean on Sportsnet, Sportsnet ONE, CBC, Rogers NHL LIVE and Sportsnet NOW. Full schedule can be found at: http://www.swiftcurrent.ca/what-s-new/scotiabank-hockey-day-in-canada/schedule. 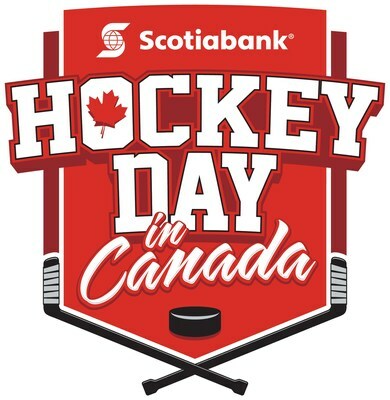 Scotiabank is proud to partner with Sportsnet to sponsor Scotiabank Hockey Day in Canada®. We are excited to bring the 19th annual edition of the hockey festivities to Saskatchewan, a province that shares Scotiabank's shared passion for hockey and belief in strong communities. *The program runs from February 2 – 9, 2019. Scotiabank will donate up to a maximum contribution of $50,000 to the NHL Foundation to fund kids' community hockey.